Classic Movie Man: Long-time Host Bids Adieu to "Meet Me at the Movies"
Long-time Host Bids Adieu to "Meet Me at the Movies"
Almost two years ago, Jackie Walker, Prairie District Neighborhood Alliance Vice President, asked me if I would volunteer and host a monthly movie event, in the South Loop that became known as “Meet Me at the Movies.” The concept: I would pick films to screen, introduce them, giving background and “color commentary” on each movie presented. Afterward we would go to a local restaurant to share a meal. My focus was on classic Hollywood films. The reasoning? Films made before the end of the production code—the mid-1960s—were for the most part, appropriate for all audiences and tended to fit within a two-hour time frame. In addition, it gave me great pleasure introducing these classic films to people who were unfamiliar with them. 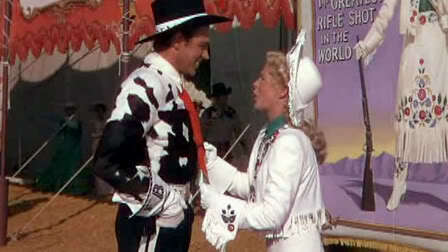 Hollywood’s golden age was a period of great creativity and artistry. So much of our popular culture comes from the movies. 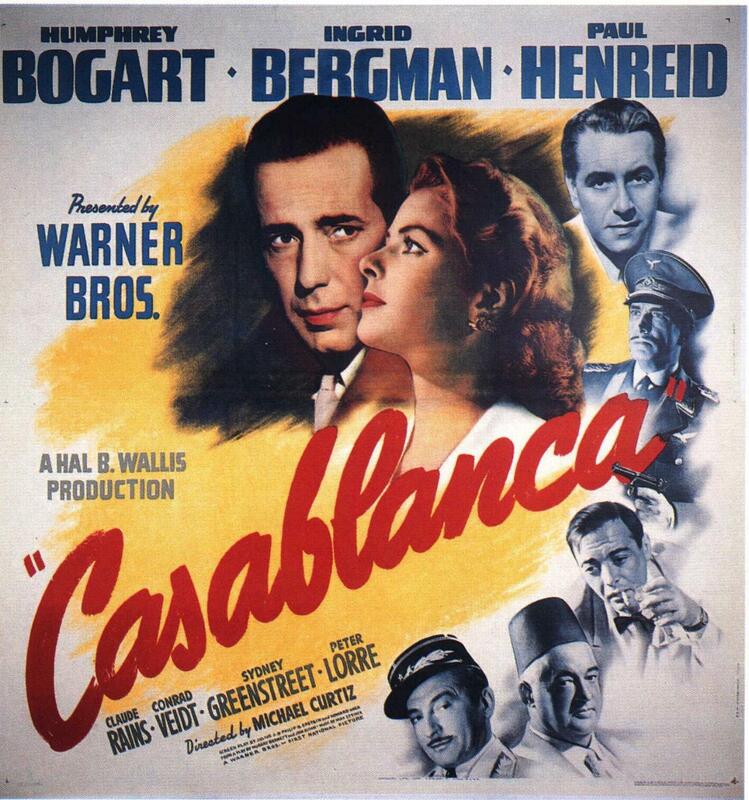 “Here’s looking at you, kid,” uttered Humphrey Bogart to Ingrid Bergman in Casablanca . 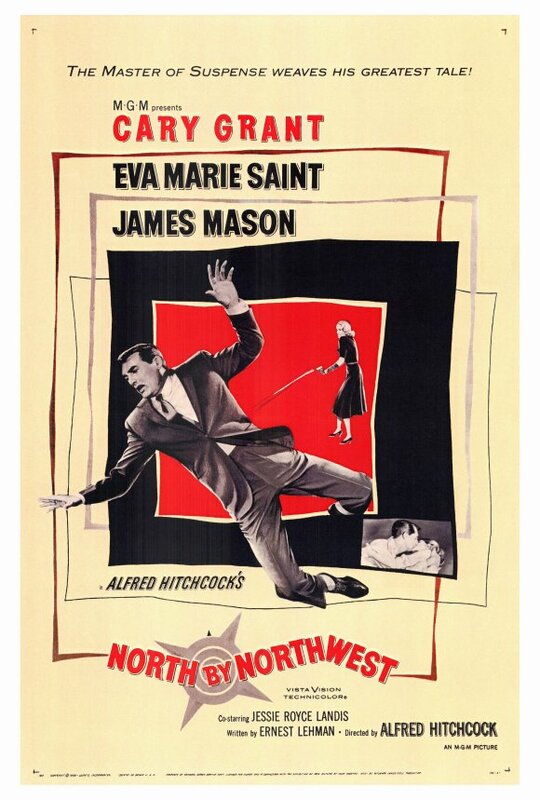 “How does a girl like you get to be a girl like you?” Cary Grant questioned Eva Marie Saint in North by Northwest , the very first MMATM event. But my all-time favorite line is, “For a charming, intelligent girl, you’ve certainly surrounded yourself with a remarkable collection of dopes,” spoken by Dana Andrews to Gene Tierney toward the end of Laura . "Casablanca" really packed the house. It was tough deciding on which classic films to screen, but I enjoyed the challenged. We screened some of the best movies Hollywood produced and showcased some of the silver screen’s most popular stars at the height of their careers, including Cary Grant, Grace Kelly, Humphrey Bogart, Ingrid Bergman, Dana Andrews, Jeanne Crain, Joseph Cotton, Teresa Wright, James Stewart, and Sophia Loren to name a few. And who could forget Marilyn Monroe, Tony Curtis, and Jack Lemmon in Some Like it Hot ? 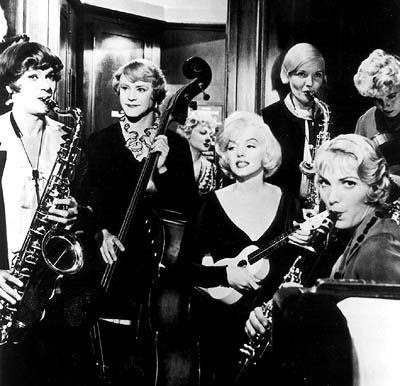 Marilyn Monroe and her "bosom" companions in "Some Like it Hot"
One of the best things about MMATM was meeting and getting to know my neighbors in the South Loop. Over the months, we developed into a community of classic movie fans, who just happened to live in the same Chicago town. What was even more gratifying were the regular attendees who came from the north and south sides of the city. I was honored that they made the trip and worked hard not to disappoint them for making the journey. 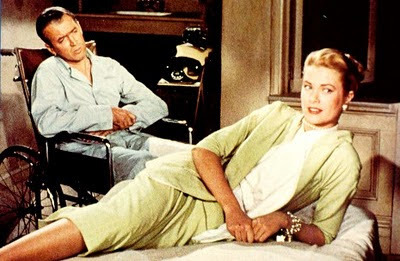 James Steward and Grace Kelly solved a murder in the Hitchcock classic, "Rear Window." Picking movies and preparing monthly presentations may not seem like much, but it was a big time investment. For this and other reasons I decided not to move forward with MMATM. I submitted my resignation to Tina Feldstein, PDNA president, and Walker before the screening of the season’s last film, The Bishop’s Wife . According to their Web site, they’re planning to continue with MMATM starting in January. Not sure what the “new” MMATM will look like, but you might want to give it a try. Thank you to all the people who came out month after month, the ones I knew by name, and the new folk that seemed to come almost every month. It was a wonderful 17 months. I will always remember my MMATM experience with great fondness. For a look back from a regular MMATM attendee, check out Bonnie McGrath's blog at the Chicago Journal by clicking here. P.S. Have a great MMATM moment/story? Please share it here. Oh no! Just as I've found you! I'm sure I won't be the only one to miss your hosting skills or the knowledge you share in regards the movies. It was a pleasure for the short time I was able to share that with you! Thank you for being who you are! Thanks, Donna. Maybe I'll do something new with another organization or on my own.I will miss all the folks that I got to know because of this event. Steve, I went to as many of the movies as I could. I always enjoyed the company, the movies and what you had to share about them. I hope you go somewhere else to do these. If so let me know!! !